Welcome Ladies and Gentlemen, my name is Yem Kosal (Nicky). I was born in 1980. I am the official English speaking guide who has been guiding for many years in Angkor Archaeological Park and other interesting sites around Cambodia. I hold a Bachelors degree of Arts in English (BA) and Masters of Education (MEd) from Bbu university, Siem Reap, Cambodia. From 1999-2002 I was a teacher of English at USA school in Kompong Cham Province. From 2002-2004 I was a computer teacher at ABC school in Siem Reap Province. 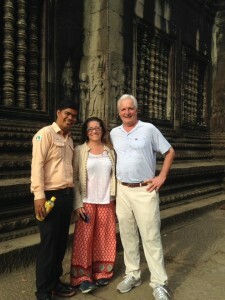 I am the operator of Guideinangkor.com in tourism sites Angkor Archaeological Park, Cambodia. Guideinangkor dot com is not the travel company but it has been built to help all visitors who want to see temples or other interesting sites around Cambodia. I make it easy for all independent visitors to get all information about interesting places and make their trip PHENOMENAL in Angkor Archaeological Park, Cambodia. The tourists that I have been guiding are mostly from USA, Australia, UK, Canada, Hong Kong, New Zealand , Malaysia, Singapore and India. I am available to assist you to make your trip PHENOMENAL. I provide a professional English speaking tour guide and comfortable Transportation to assist you during your holiday in Cambodia. Angkor Archaeological Park in Cambodia is one of the most sought after archaeological destinations in Southeastern Asia. The location of Angkor Archaeological Park in Cambodia is towards the northern part of the Kingdom of Cambodia. 400 square kilometers of forested lands form the backdrop of Angkor Archaeological Park in Cambodia. As recognition of its immense historical and archeological significance, the Angkor Archaeological Park in Cambodia has been included in the prestigious list of UNESCO World Heritage sites in the year 1992. This magnificent site has also been identified as a World Heritage in danger. The exhibits of Khmer Empire are the main attractions of the Angkor Archaeological Park in Cambodia. Most of the attractions in this park date back to 9 th to 15 th century CE. Among the most popular sites within the Angkor Archaeological Park at Cambodia, the Angkor Wat Temple, the Bayon Temple and at Angkor Thom are worth mentioning. The ancient carvings will surely add to your pleasure. All the temples in Angkor Archaeological Park of Cambodia are done up in symbolic figures. The earlier temples of this park resemble the Hindu architectural style. However the structures built in the Angkor Thom, the new capital city, feature the Buddhist architectural pattern. Besides the Bayon Temple, Ta Prohm and Preah Khan are some of the other Buddhist sites that are worth viewing in the Angkor Park in Cambodia. We’re American tourists, recently visited Siem Reap to see Angkor. It was a fantastic experience. This place is clearly one of the most impressive historic places anywhere in the world. A very interesting experience in our trip turned out to be to work with a tourist official guide who became my friend on Facebook even before our engagement ended. Yem Kosal is a person who came from extremely poor background and now is a computer instructor and English tourist angkor guide. Very articulate, friendly, and knowledgeable person. It was fun to work with him. He is definitely one of the best guides I ever worked with. More interestingly it is impressive that he is running a foundation to help children from the earnings he makes as well as from the web site that he runs. If you are going to visit there, contact him. Your trip will become more enjoyable.